In 1978 Luis Valdez’ musical Zoot Suit premiered at the Mark Taper Forum in LA. The production opened a door on a chapter of Los Angeles history that many had forgotten. During the early forties, as the US was fighting WWII, the city was rocked for months by racial violence, sparked by the death of a young man that may have been the result of a gang rumble. Though there was no proof that it was a homicide, hundreds of Latinos were detained in connection with the case, seventeen were tried as a group for the “crime”, and twelve were sent to prison. The trial, which was a sham, inflamed racial tensions in LA, and led to a series of violent clashes between Latinos and servicemen that went on for months. The conflict peaked with an incident in which thousands of white servicemen and civilians descended on East LA, assaulting the people who lived there at random. Who the hell would have the nerve to take this gritty slice of LA history and turn it into a musical? But that’s exactly what writer/director Luis Valdez does, and he pulls it off with sharp wit and smooth grace. Valdez changes the names and condenses the action, reduces the defendants from seventeen to four and focusses on a semi-fictional character named Hank Reyna. We see the story unfold through Hank’s eyes, experiencing his struggle with a world where the deck is stacked against him. More importantly, we are privy to his inner struggle to figure out who he is. Throughout the play Hank is visited by El Pachuco, a mythic figure dressed in high style, who keeps pressing the same question. Is Hank going to live by somebody else’s rules and let society define him? Or is he going to define his own identity? But this slick hipster in the broad-brimmed hat and baggy pants doesn’t just play the part of Hank’s conscience. He sings, he dances, and he serves as a cross between narrator and ringmaster. Clearly Valdez is not interested in realism. This is not a historical reenactmant. “But relax,” El Pachuco purrs to us as the play opens. “Weigh the facts, and enjoy the pretense.” And then he adds, “Our pachuco realities will only make sense if you grasp their stylization.” Valdez doesn’t see artifice as just a convention necessary to staging a musical. 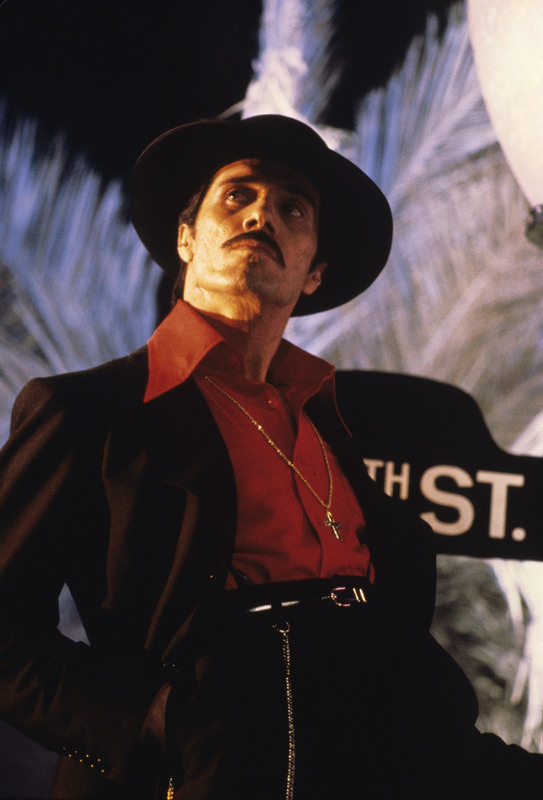 It’s central to what Zoot Suit is about. The brash style and broad gestures come from the lives of the people being portrayed. In making the film, Valdez uses the musical as it was staged, but takes advantage of the language of cinema. Though there are a few instances where I had problems with this approach, for the most part it works well. The artifice of the theatre is completely in keeping with Valdez’ “fantasy”. The story begins the day before Hank is set to join the Navy. He’s anxious to go off and fight in the war, but first he’s just going to have one last night out. Hank gets dressed up in his “zoot suit”, much to the chagrin of his father, a hardworking Mexican immigrant who gets even more upset when his kids refer to themselves as Chicanos. But dad calms down, and Hank goes off with his brother and sister to party at a local nightspot. A run in at the club leads to a rumble in the Sleepy Lagoon. Hank is arrested and thrown in jail. We see him quickly stripped of everything he has, his freedom, his family, his girlfriend, his pride. The trial is also a piece of theatre, in which the prosecution and the judge insist on defining the defendants on their own terms. Hank and his friends are not convicted of committing murder. They’re convicted of being pachucos. Racism is a major issue in Zoot Suit, but Valdez doesn’t allow his story to fall into a simple us-versus-them dynamic. He knows that things are more complex than that. One of the young men sentenced to jail is an anglo kid who has grown up in Hank’s neighborhood and accepts the local culture as his own. He dresses the way his friends dress, talks the way his friends talk, and when his friends are sent to prison by a racist legal system, he suffers along with them. Is he Mexican? Is he American? Does it matter? And when Hank accuses Alice, who’s been fighting to get him released, of exploiting the case for political purposes, he learns that as a woman and a Jew she’s subjected to discrimination just as he is. This all sounds pretty downbeat, and certainly the play deals with some ugly realities. But there’s also a lot of joy in Zoot Suit. The action is punctuated by a series of lively, raucous musical numbers that sometimes serve as a mocking counterpoint to the drama, and at other times show the vibrant joy that people can feel even in the worst of times. Valdez obviously loves the music of the forties. He revels in the chance to conjure up the spirit of Latin American swing and resurrect a number of choice songs from the era. Zoot Suit is a lament, but it’s also a celebration.